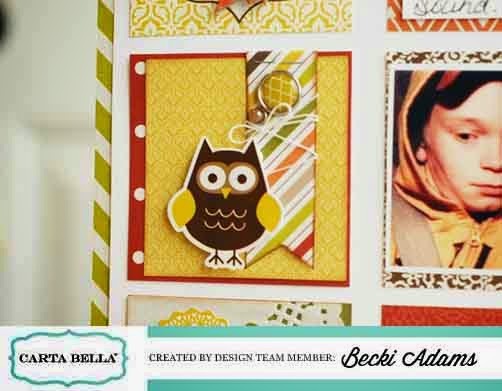 Yesterday I had a project on the Carta Bella blog. I don't have a lot of Thanksgiving photos but I did have one photo I took on Thanksgiving Day last year that had a story that needed told. I combined that photo with the Perfect Autumn collection to tell the story. I decided to create my layout using three 3x3 squares and three 3x4 squares and placed them on a grid design. The smaller squares contain more embellishment and are placed down the left side of the layout. The larger rectangles are placed down the right side of the layout. Because both of our families live within a few miles of our home. We are blessed to spend the day with both families. Last Thanksgiving as we were driving home (late at night). We got a flat tire on our car. I was nervous about my husband fixing the tire in the dark on the side of the road. Luckily my father-in-law was close by and brought the tools that my husband needed and safely helped my husband fix the flat tire. Meanwhile, my little man had fallen asleep snuggled up to his big brother. Sitting in the car that night I took an extra moment to be grateful that our little family was safe and that we had family close by to help us. Precious story & layout! Love the blocked style & pretty colors! Thank you! I had fun putting this one together with a grid design. Thanks Brianna~ I've vowed to take more photos this Thanksgiving but still tell the unique story behind the photos!